Jian-Hui ZHAÏ, Modélisation à l'échelle atomique des mécanismes de montée de dislocation dans les oxydes . Thesis started in 2018. Riccardo REALI, Modeling creep of lower mantle minerals: bridgmanite and (Mg,Fe)O. Thesis defended in 2018. Other co-advisor: Patrick CORDIER. Srinivasan Mahendran, Numerical modelling of dislocation core properties in olivine (Mg2SiO4). Thesis defended in 2018. Other co-advisor: Patrick CORDIER. Present position: Postdoctoral Researcher, Chalmers University of Technology, Gothenburg, Sweden. Alexandra Goryaeva, Modeling Defect and plasticity in MgSiO3 post-perovskite at the atomic scale. Thesis defended in 2016. Other co-advisor: Patrick CORDIER. Present position: Post-doctorat au commissariat l'énergie atomique. 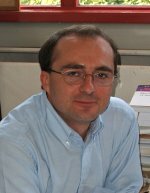 Antoine Kraych, The role of dislocations in bridgmanite deformation : an atomic scale study. Thesis defended in 2016. Other co-advisor: Patrick CORDIER. Present position: Post-doctorat à l'Institut Lumière Matière, Université de Lyon. Sebastian Arthur Willem Ritterbex, Modélisation de la plasticité dans la wadsleyite et la ringwoodite : sur la dynamique des dislocations dans la zone de transition du manteau terrestre. Thesis defended in 2016. Other co-advisor: Patrick CORDIER. Present position: Post-doctorat au Geodynamics Research Center, Ehime University, Japon. Nils Garvik, Multiscale model of plastic properties of Fe3C . Thesis defended in 2016. Other co-advisor: Patrick CORDIER. Present position: Consultant en infrastructure, société Sogeti, Lille. Jonathan Amodeo, Multiscale model of plastic deformation of MgO single crystal : from the laboratory to the earth mantle. Thesis defended in 2011. Other co-advisor: Patrick CORDIER. Present position: Chargé de recherches CNRS au laboratoire MATEIS, INSA de Lyon. 82 oral presentation(s), including 20 invited. 41 poster(s). Detailled list.